Cascada de Flores returns to the Freight to present a bilingual music and dance program for children. As roster artists with both Young Audiences of Northern California and Performances to Grow On in Ventura, they have performed in over 300 Western US schools, reaching over 50,000 students with their educational program. In addition, Cascada de Flores was featured twice in World Arts West’s arts education program People Like Me. Arwen Lawrence (voice), Jorge Liceaga (guitar) and Saúl Sierra-Alonso (double bass) will perform The Tree And The Donkey Who Loved To Sing (El Árbol y el Burro que Quería Cantar) for children of all ages. 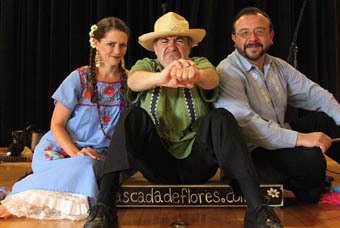 In this bilingual and participatory program, Cascada de Flores tells their own origin story of traditional music and dance, which explodes with rhyme, fun musical instruments and sweet characters. You might meet the donkey and it’s jawbone, the abuelito and the vulture, the marimbol, the dance box, and the little “mosquito” guitar. Children and their families are invited to sing, dance and play with beautiful traditional songs and dance pieces. Inspired by the trio’s journey to Veracruz, Mexico, where old traditions are kept alive by generations of families in the countryside, this story speaks of the diversity of roots in Mexico (especially the indigenous, Spanish and African roots), improvisation and inventiveness within traditions, life and death in nature and, from nature, the making of musical instruments and song.